Four-year old Aziz Ali had been suffering from a facial rash for a year when his father brought him to Bamyan Provincial Hospital (BPH) for treatment. BPH did not have a dermatologist, so the eHealth clinic there scheduled a live teleconsultation for Aziz with a dermatologist at the French Medical Institute for Children (FMIC) in Kabul. Through the teleconsultation, Dr. Hayatullah Noori Shalizi at FMIC diagnosed Aziz with Atopic Eczema. He was prescribed medication for two weeks and made three follow-up teleconsultation visits with Dr. Shalizi during his treatment. Aziz’s village in Charda Yakowlang District, a remote area in northwestern Bamyan, is over 400 km from FMIC. But now, he only had to travel about a 100 km for his teleconsultations. Patients that come to Bamyan with their families for this service save an average of USD 872 and 51 hours of travel time. For Aziz, besides monetary and time savings, the eHealth service gave him and his family much needed timely medical treatment. Nazrigul and Bekmamad visited different hospitals in hope for a diagnosis for their baby daughter. It wasn’t until they brought her to Khorog Oblast General Hospital and were referred for a teleconsultation with a specialist at National Medical Centre, that they found out their daughter had Down Syndrome. Hear their story of how they received much needed diagnosis and treatment for their daughter through our teleconsultation service. Fourteen year old Rabia, from Ghizer District in northern Pakistan, had been experiencing psychological problems since 2010. Headaches; mood swings; disturbed sleeping cycles; thoughts of self-harm and anhedonia, the inability to experience pleasure from activities usually found enjoyable, constantly plagued her. In 2012, her condition worsened. Due to a lack of psychiatry services available in the area, Rabia’s family had to travel to Islamabad, the capital city, for medical care. Since Gupis is over 500 km from Islamabad, each of these trips burdened the family with travel and accommodation expenses and took a minimum of a week’s time. With no other option, the family continued to bear this cost and do what they could to treat Rabia. 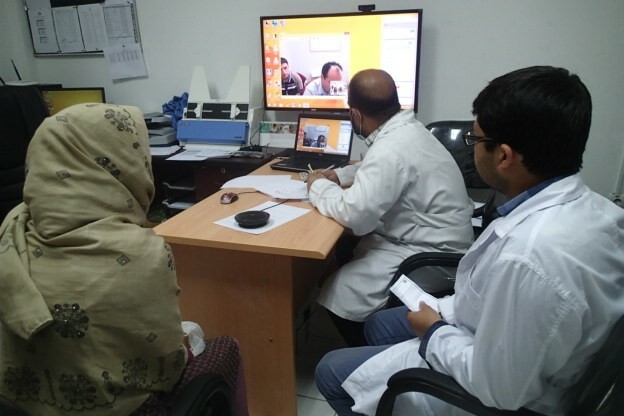 In 2014, they learned of the AKDN eHealth Programme’s new telepsychiatry service between Gilgit Medical Centre (GMC) and specialists at the Aga Khan University Hospital, Karachi (AKUH, K). With GMC only 100 km from their district, they began availing the service. Apart from the initial teleconsultation, Rabia came with her family to GMC for multiple follow-up consultations. Rabia reported experiencing elated mood levels and feeling happier and positive over time. If teleconsultations at GMC weren’t available, Rabia’s family would have to move to Karachi or Islamabad for her treatment. They believe this service will benefit patients in the region as it provides diagnosis and treatment from a specialist at a distance without burdening patients with expenses and the challenge of travelling long distances. The eHealth service at GMC saves patients an average of USD 227 and 45 hours of travel time per consultation otherwise spent travelling to the nearest next level facility for the same service. For four months, Fatima Ali had been suffering from a facial rash, a black pigmentation on her face, which worsened over time to cover her nose and cheeks. Initially she visited a hospital in her district in Northwestern Bamyan, an hour away from her home, but the treatment did not prove effective. She then came to Bamyan Provincial Hospital (BPH). Dermatologists are not available at BPH, but she was referred by the eHealth clinic there for a teledermatology consultation with Dr Hayatullah Noori Shalizi, a dermatologist at the French Medical Institute for Children (FMIC) in Kabul. Through the teleconsultation, Dr Shalizi determined that Fatima had a severe allergy and prescribed medications. Within six months of the teleconsultation and taking the medications, Fatima completely recovered. “Had teleconsultation services not been available at Bamyan Provincial Hospital, I would have to travel to Kabul for treatment, a near impossible option for me given the cost, distance and time involved. I am very grateful for the eHealth Programme for providing such an important service,” recalls Fatima. Fatima says she felt comfortable consulting a doctor virtually and thinks the best part of the service is that it provides patients access to a high-quality service while saving them money. AKDN eHRC and the Aga Khan University (AKU) Stroke Program collaborated to develop Movies4Stroke, a series of educational movies for stroke patients and their caregivers. The movies are designed around conditions faced by stroke patients in a low-and middle-income country that lacks rehabilitation centres and chronic support systems. Leveraging Pakistan’s 77% mobile phone density level, the project tests the effectiveness of a mobile phone-based video intervention. Five-minute videos on stroke are placed in a mobile application that patients and their caregivers watch during multiple sessions at discharge and afterward. Outcomes such as patient’s medication adherence; functional progress; blood pressure; caregiver’s knowledge; hospital readmission; and stroke-related mortality are assessed to test the effectiveness of the intervention. When Asiya gave birth to twin girls, she found out they were conjoined, partially connected at the abdomen and pelvic area. In search of medical assistance, she and her husband Ali took their daughters to Faizabad Provincial Hospital (FPH). Realizing the critical and time-sensitive nature of the case, the doctors at FPH scheduled a live teleconsultation with Dr Jalil Wardak, Head of Paediatric Surgery, at the French Medical Institute for Children (FMIC) to get his expertise on the case. Dr. Wardak examined the twins remotely and determined that a surgery was needed. Considering the severity of the case and the family’s financial condition, FMIC also agreed to provide the treatment for free, through one of its patient welfare programmes. At FMIC, the twins underwent a series of tests and assessments from doctors from the surgery, anesthesia and radiology departments. The five-hour long surgery, performed by Dr Wardak and his team of local doctors and nurses, resulted in the successful separation of the twins. This was also the first successful case of separating conjoined twins in Afghanistan. The twins, Maryum and Asma stayed at FMIC for 15 days before getting discharged. “I was worried that all this might be a dream. But when I saw my daughters sleeping in separate beds, I realized that my dream has come true” said Asiya. Sara was born with a congenital brain malformation. When she was only a month old, her family consulted a local paediatrician in Faizabad who advised them to take her to Faizabad Provincial Hospital (FPH). A live teleconsultation between FPH and Dr Mohammad Akbar Shirzad, Consultant General Surgeon at the French Medical Institute for Children (FMIC), Kabul enabled Dr. Shirzad to diagnose Sara’s condition as a complicated case of occipital meningoencephalocele, a protrusion of the brain through a birth defect in the skull bones. Realizing the severity of Sara’s condition from the teleconsultation, Dr. Shirzad decided that she needed to come to FMIC for surgery. “Three decades of war, poverty and malnutrition have led to an increase in such cases in Afghanistan. The teleconsultation enabled us to detect Sara’s condition on time as there was a very slim chance of her survival,” said Dr. Shirzad. Sara’s father Samir Ahmad is a primary school teacher in Badakshan and the only bread winner for a family of eight. His modest salary could not afford the trip to FMIC or the cost of surgery. The Children House Project, one of FMIC’s patient welfare programme’s sponsors, arranged for funds including full medical cost, transportation and accommodation for the family. At FMIC, a team of surgeons successfully operated on Sara, excising the occipital mass. A second operation was performed a week later to insert a ventriculoperitoneal shunt to relieve pressure from her brain caused by fluid accumulation. “Without the welfare programme’s assistance, it would have been impossible for me to afford Sidra’s operation. We are grateful to the doctors at Faizabad and FMIC for saving my daughter’s life,” said Samir Ahmad. Sara stayed in the paediatric ward for two days before returning with her family to Faizabad. She soon made a full recovery. Three-month old Thomas had struggled with his health since birth. At only two weeks old, he was unable to keep food down, continuously vomiting after every feed, sometimes as many as six to eight times a day. His birth weight started at 3.3 kg and hit a low of 2.5 kg. It was at this point that Regina, Thomas’s mother, brought him to the Primary Medical Centre (PMC) in Mwanza for a consultation. Doctors assessed the baby and referred him to the Bugando Medical Centre (BMC), a zonal hospital in Mwanza for treatment. He was admitted at BMC for a week, where he was given IV fluids and medications which reduced the vomiting. But it wasn’t long after being discharged that he fell ill again. The vomiting returned indicating that the cause of his condition had not been addressed. Thomas was brought back to the PMC where Dr. Gulshan Himani, a Family Medicine Physician requested a live teleconsultation with Dr. Mariam Noorani, a paediatrician at Aga Khan Hospital, Dar es Salaam (AKH, Dar). Dr. Noorani assessed Thomas’s condition via the teleconsultation and requested further tests including an abdominal ultrasound and electrolyte assessment to confirm diagnosis of infantile hypertrophic pyloric stenosis. Upon confirmation of diagnosis, the next course of treatment was surgery. However, since a paediatric surgeon was unavailable in the Lake Zone Region, it was recommended that Thomas be brought first to AKH, Dar. After an in-person consultation with Dr. Noorani, Thomas was referred to Muhimbili National Hospital (MNH) for surgical correction and stabilisation. The surgery was successful and Thomas was discharged three days later. Regina had follow-up visits with Dr. Noorani who monitored Thomas’s development. After the surgery, he started gaining weight and looking healthy. This story is an example of how, through JHI’s eHealth Programme, expertise is shared across regions to provide quality patient care, easing the barriers of distance. Early identification of unusual and difficult cases allows for early treatment and improved quality of care for families. Thomas’s case is an example of referrals within a public-private partnership with the Mwanza PMC, AKH, Dar and MNH collaborating to improve the health outcome of patients such as Thomas. 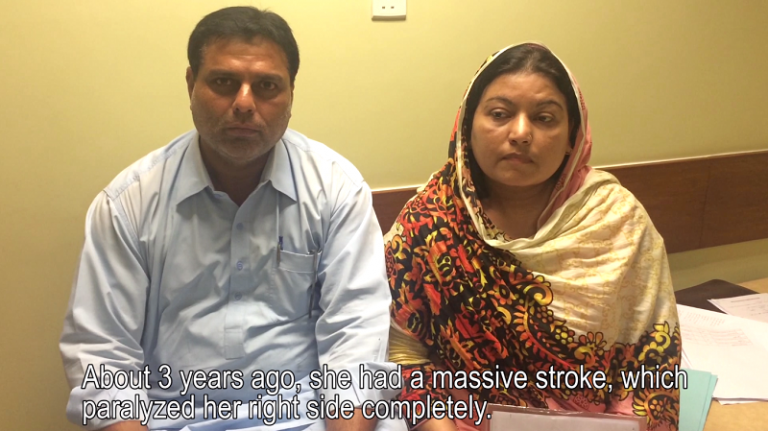 Nasima had been suffering from epilepsy for ten years. She sought treatment from several hospitals including ones in Kabul, which would take her five hours to reach. But she wouldn’t see any improvement. She then heard about Bamyan Provincial Hospital’s (BPH) eHealth clinic, only 20 minutes from her house. At BPH, an emergency teleconsultation was scheduled with Dr. Esmatullah Hamed, Neurologist, at the French Medical Institute for Children. Dr. Hamed examined Nasima, prescribed medication and asked her to come to BPH for follow-up teleconsultations with him. Before receiving treatment through the teleconsultation, Nasima used to have three to four convulsions a day; now she does not have a single convulsion. Names of patients and family members have been changed to respect privacy.